Home > Projectors > Optoma HD142X Review – Worth Buying? Optoma HD142X Review – Worth Buying? If you are looking for a quality multimedia projector at a decent price tag, Optoma HD142X is one of the best options available out there in the market today for you to consider. It is a simple and a convenient projector, which has the ability to give life to a quality output with 3,000 ANSI lumens. The portability and lightweight design of this projector have also received a lot of attention. Read Optoma HD142X review further to explore its features, specifications and performance. HD142X is upgraded version of the brand’s successful product HD142X. The color quality delivered by the latest multimedia projector is impressive. In fact, it has the potential to deliver accurate REC 0.709 colors. As a result, people who use this projector have the opportunity to enjoy a true-life color experience without any hassle. It would be ideal for a home as well as an office and you will be able to use it for a variety of purposes as well. You can watch your favorite movies or sporting events on big screen with the help of this projector. On the other hand, you can simply connect your console to this projector and enjoy a unique gaming experience. Optoma HD142X multimedia projector has been provided with two different HDMI inputs. These HDMI inputs can be used to connect your gaming console, media streamer, Blu-ray player, PC, laptop or even the smartphone. You just have to connect the input device and switch it on. You can also think about connecting a HDMI dongle such as Apple TV, Google Chromecast and Amazon Fire TV to transform the multimedia projector into an HDCast instantly. People who spend their money in order to purchase Optoma HD142X multimedia projector don’t have to worry too much about its durability. That’s because it has been provided with a longer lamp life. In other words, the lamp of this multimedia projector would last for about 6,500 hours. Therefore, you will be able to use it for more than a decade without any hassle. 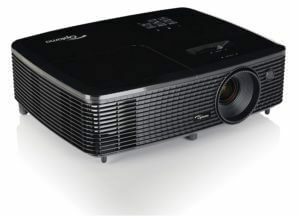 The Optoma HD142X multimedia projector is capable to project 3D content as well. However, the 3D content projected on your screen would not be much realistic. In other words, you cannot expect the same picture quality as you watch 3D movies on your 3D TV, but watchable. This projector is compatible with a rapid refresh rate of 144Hz to deliver the best possible viewing experience for the people in need. Therefore, people who use it will be able to experience flicker free and ultra-smooth images. On the other hand, it is compatible with 1080p full HD video file formats. As a result, you will be able to enjoy crystal clear images with maximum clarity. One of the most notable features that can be found in Optoma HD142X multimedia projector is its auto power off functionality. It is smart enough to detect the times that you do not use the projector. In that kind of a situation, this projector would turn off on its own to save power as well as the lifetime of the lamp. It also has quick resume functionality, which would help you a lot if the power is switched off accidentally. LG 50UH5500 Review – Worth the price?